San Pedro is full of great places to stay. 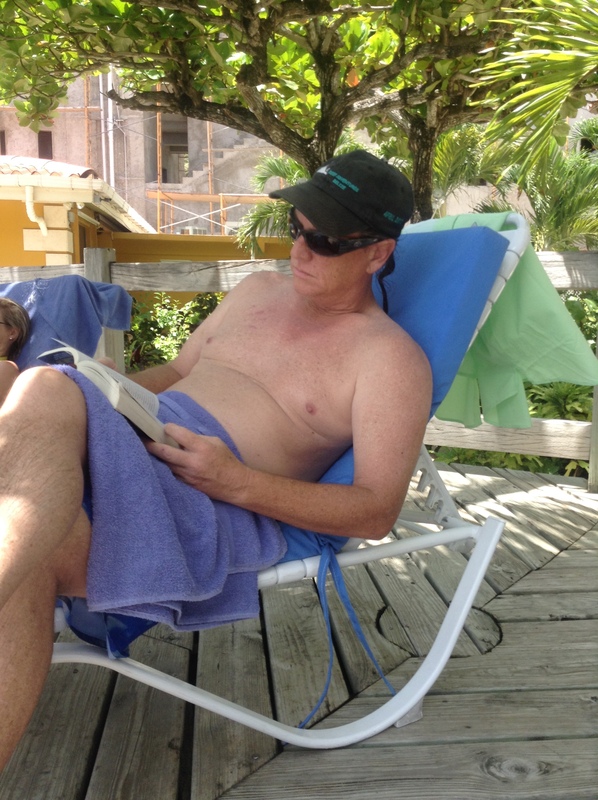 Since we’ve been in Belize Barry and I have had the opportunity to stay at many different places on Ambergris Caye. Sometimes we take our children. And sometimes we don’t. Sometimes we want upscale. Sometimes we want to be in town near our friends. The view from our room #201. Our most recent visit was a first for us. We usually travel with more kids or just the adults. This time it was my husband, three year old daughter and I. We headed off to the big island for some much needed R&R and family time. 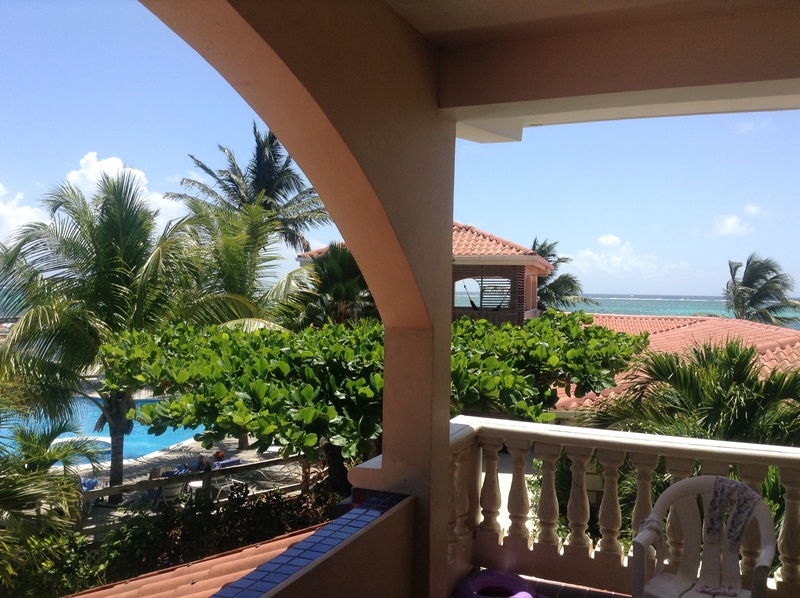 This visit we chose to stay at the Sunbreeze Hotel – located just across the street from the small airport. It was a perfect choice! A quick read through the latest reviews on TripAdvisor lets you know Sunbreeze is a well liked hotel. We had such a good time here I wanted to share it with you all. 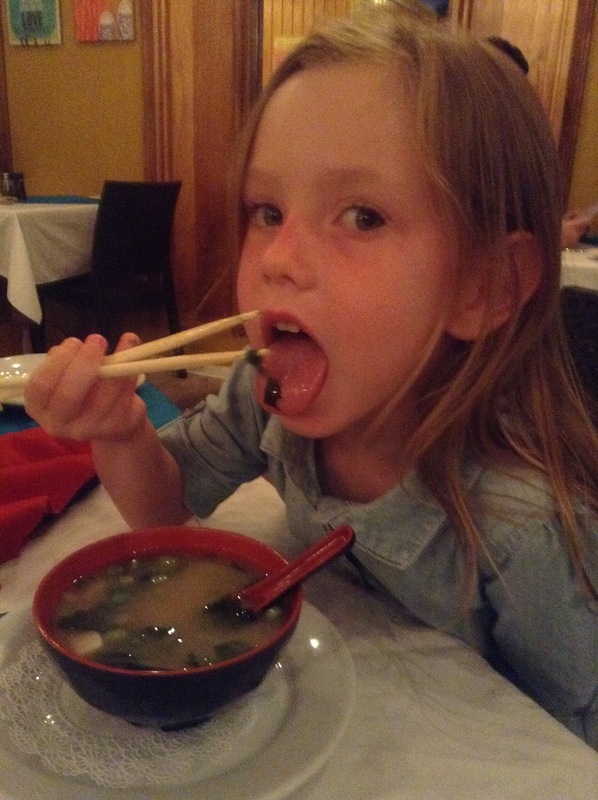 Sabrina eating her miso soup at Blue Water Grill. 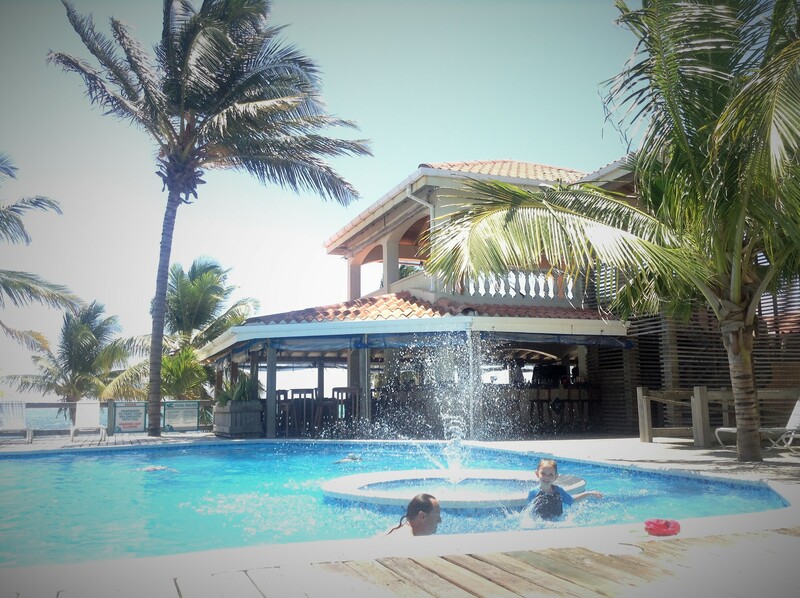 One of the best parts about staying at the Sunbreeze is the large pool and attached restaurant & bar – Blue Water Grill. The BWG is famous in San Pedro for their outstanding food, drinks, and service. Twice a week they have Sushi! We really enjoyed introducing Sabrina to her first sushi dinner. What makes Sunbreeze and BWG the perfect pair is you can play all day in the pool with the family and when hungry or thirsty for that cold Caribbean drink – you’re just steps away from ordering. And you don’t even have to put on your clothes! And when you are ready for a nice evening out – your rooms is also just steps away. Freshen up and head back to the restaurant for a luxurious oceanfront dinning experience. The atmosphere at Sunbreeze is very conducive to relaxation. The common area on the ground floor has comfortable seating – in and out of the sun. It’s full of manicured flowers, tall palms and hammocks. And for the little ones – plenty of sand to play in. We picked up some plastic sand toys at the local grocery store and Sabrina had a blast building and smushing and digging. Our room was very comfortable and we all slept well. The room included a mini fridge and plenty of counter space. Perfect for throwing together PB&J’s and keeping juice and drinks cold. A rare sighting of Barry relaxing! The shower was a generous size – ok its HUGE – which is so awesome for after swimming because you can all hop in together and get clean! Another favorite is the ample space to hang up those wet suits and shirts and towels. Things don’t dry as quickly in the high humidity of Belize so its key to be able to have somewhere to lay things out to dry. Barry & Sabrina playing in the pool. The hotel definitely attracts all types of travelers of all ages. Families were prevalent but we also met a group of divers, a couple on their honeymoon and two teachers on their Spring break. The property is located so close to everything you could want. Rent a golf cart. Go shopping for unique art or souvenirs. LOTS of delish places to eat within just a couple of blocks. Go diving. Go drinking. Positioning yourself at the Sunbreeze puts you right in the middle of all San Pedro has to offer. 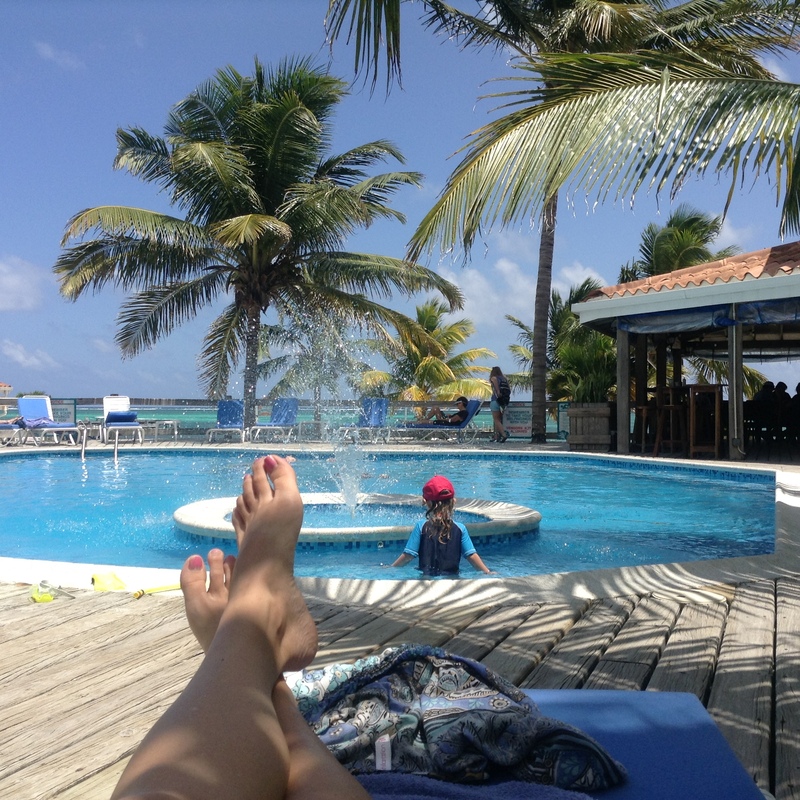 I recommend Sunbreeze for the discerning traveler – for the family – or for those wanting to experience San Pedro without having to ride for miles on a golf cart. Everything you want and need is just steps away from your room. Go check them out!